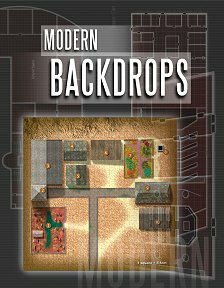 Publisher's blurb: "Modern Backdrops is a unique and exciting resource for the Modern d20 System gamemaster. This collection offers you a series of well-developed cities, each with its own unique history, information on the important people and places, maps of specific locations, and plot hooks to help jump-start your campaign and get your players involved. These cities were created with the FX game in mind, but the information provided for each city should be sufficient for any style of game to be set, successfully, inside the city limits."